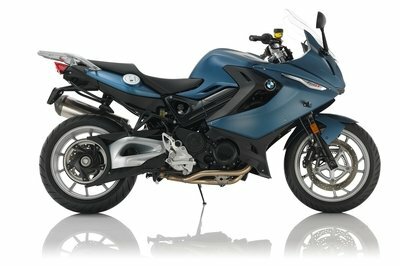 Back in 2014 at the EIMC, Yamaha introduced us to its latest effort to join the ranks of sport-touring motorcycle manufacturers with the 2015 FJ-09. 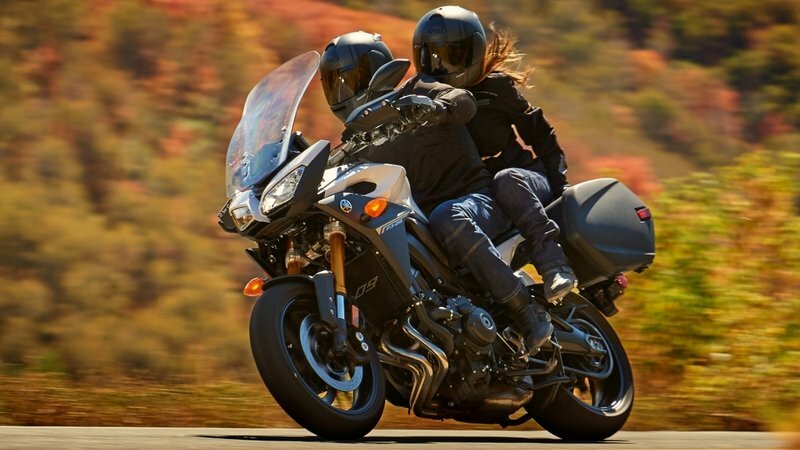 Essentially, the factory took its naked FZ-09 and refined it for longer trips with a front fairing, windshield and expanded pillion seat area, leaving us with a smaller displacement, and less expensive, version of the dual-sport Super Ténéré. Brought forward for 2017, it’s sort of an entry-level model for the adventure bike market, just without any claims of off-road capabilities. Feedback so far suggests that it makes an outstanding commuter bike, which to me speaks volumes about this ride. Sure, long trips give plenty of opportunities to discover any less-than-desirable characteristics on any given bike, but I submit to you that commuters get even more opportunities to learn about their machines through daily use in traffic situations and inclement weather. I consider the daily grind to be a sort of crucible that separates the wanna-be bikes from the truly capable. Join me as I delve in to see what made this bike so popular in such a short period of time. 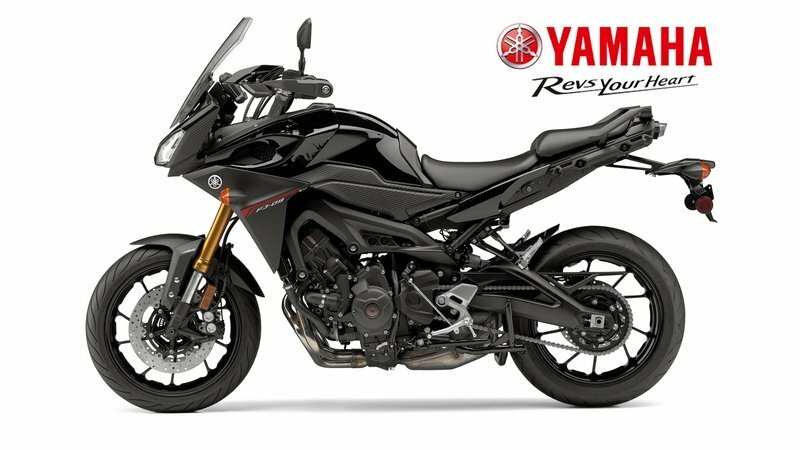 Continue reading for my review of the Yamaha FJ-09. 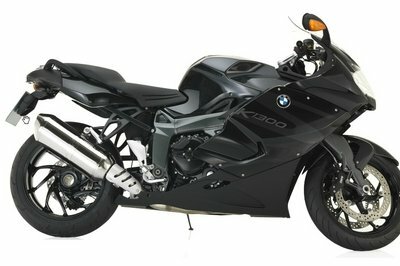 Designers settled on an attractive blend of angles and a smoothly swooped tank to define the overall look of the FJ-09. A large flange atop the tank looks like a good spot to hang one’s knee in a really deep turn, but they look to be a bit too far from the rested leg position to actually be used as such. The front fairing is rather minimal — mainly just a headlight housing and windshield mount — and by itself is unlikely to shield the rider from much in the way of weather. Most of the protection comes from the windshield itself. One detail I am glad to see is the vented windshield arrangement that allows some air to bleed beneath the “glass” to relieve the pocket of low pressure that forms when underway. Some of my most miserable riding experiences were on my old FXRP, where the fairing and tall windshield worked together to deprive my full-face helmet of enough air to vent properly, leading to a hopelessly fogged up visor and sweat-drenched hair. A vented windshield combats this adverse effect and provides a much more comfortable ride, which is arguably the most important attribute for a commuter bike. Comfort was a front-burner topic for the designers, and to that end, they set up an adjustable rider triangle so you can tweak it for your body type and preferences. The handlebars, seat position and windshield height are all adjustable, and even though they don’t move much, at least you don’t have to visit the accessories catalog and put the bike in the shop to adjust your ride. To be fair, I have to gig Yamaha at this point. The factory, like so many others, released the FJ-09 as a sport-tourer, and spent considerable energies on tweaking this ride for extended riding. Why they neglected to mount bags on the bike as standard equipment is quite beyond me. Sure, you can get hard side panniers and a tour-pack from the accessories catalog, but that is true for nearly every bike out there, especially if you look to the aftermarket for your baggage. I realize that what constitutes a tour bike in Japan does not necessarily jibe with U.S. rider’s perceptions. To us (U.S.? ), tour bikes need bags to qualify as such, and we expect to see them. Wink nudge Yamaha, wink nudge. An aluminum frame and swingarm starts the build out nice and light, and contributes to the 462 pound curb weight. The subframe was beefed up a bit, and is wider than the one used on the FZ-09 to support the big pillion seat and the weight of the (accessory) bags and their cargo. At only 56.7 inches long, the FJ is a rather compact bike, though the seat height of 33.3 inches or 33.9 inches, depending on how you adjust, it leaves it a trifle tall for short inseams. Rake is rather steep at 24 degrees, and the 3.9-inch trail lends the FJ some rather nimble handling characteristics. Inverted front forks with 41 mm tubes and anodized sliders provides 5.4 inches of travel while the rear monoshock gives up 5.1 inches of travel. Both ends come with adjustable preload and rebound parameters, which are sufficient for most non-sportbike riders, but if you are used to more detailed adjustments, these features may feel a little flat. In addition, word on the street has it that the suspension is a little bit on the squishy side, and the adjustments can’t quite compensate for that. While I would prefer to run a little too soft than a little too hard, I understand that more aggressive riders may prefer to stiffen up a bit. Perhaps Yamaha will address this in the future. Cast, 17-inch rims mount the rubbers, and four-pot, opposed piston calipers bind the dual, 298 mm discs up front, and a single, pot-and-anvil caliper pinches the 245 mm disc in back. An anti-lock brakes system monitors wheel slip and modulates brake forces to prevent loss of traction due to overbraking or low-traction conditions. While ABS is no substitute for skill, it can help to keep new riders upright long enough to develop said skill, and given the stated use as a commuter bike I think ABS is a good move here to help riders negotiate heavy and/or unpredictable traffic situations. The factory ripped its 847 cc, Crossplane Crankshaft Concept engine out of the sporty FZ frame and stuck it into the FJ, so you can believe in the “sport” part of the sport-tourer moniker. This in-line triple cranks out around 113 to 115 horsepower, depending on who you ask, and produces 65 pound-feet of torque. One of the complaints about the FZ had to do with a certain twitchiness in the throttle control, and the factory addressed that problem. The FJ uses a Ride-by-Wire system, what Yamaha calls its YCC-T feature, and it helps to moderate power delivery a bit. Not only that, but the bike comes with a drive-mode (D-Mode) function that provides variable throttle responses based on one of three selected presets, so you can tune the engine down to match the prevailing conditions and your skill level/ comfort zone. This allows for the addition of another nifty feature: the Traction Control System (TCS) that monitors wheel speeds and intervenes by closing off the throttle a bit and varying the ignition timing. With this and the ABS system at work, you have traction protection coming and going, with the same caveat about technology being no substitute for technique, of course. The TCS system was updated for the 2017 model, so if you tried it in prior years and found it lacking, have a look again. A six-speed transmixxer with a wet clutch pack sends power to the rear wheel via a good, old-fashioned chain final drive. While I realize this really isn’t a “sport” bike, it does have very sporty roots, and will appeal to riders with crotch-rocket experience. 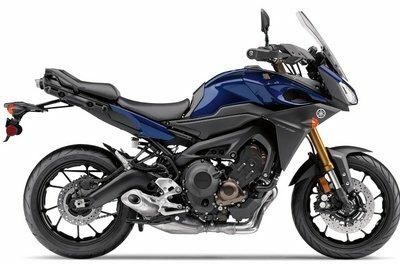 With that in mind, I questioned the lack of hydraulic-assistance, or “slipper” technology in the clutch — the main purpose of which is to limit back torque on downshifts — in prior models, but Yamaha came through for the 2017 model by adding a new assist and slipper clutch. It makes for a kinder left-hand experience by making the clutch lever easier to pull in and disengage the clutch, something you will appreciate around the hundredth shift or so while dealing with obnoxious traffic. Sticker shock is almost non-existent with this ride. MSRP for 2017 is $10,699 — up a couple of bills over the last couple of years — for Galaxy Blue or Electric White. 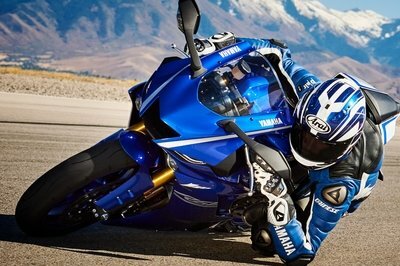 Yamaha covers your new ride with a one-year limited warranty. 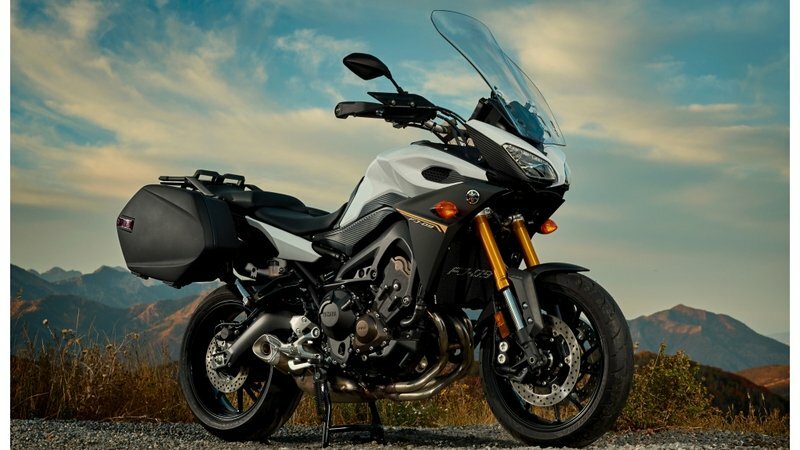 Ach, with so many sport-tourer/adventure bikes out there, and more coming every year as the sector growth booms, I was able to find a very close competitor for an apples-to-apples comparison. The V-Strom 650 ABS from another Japanese heavy, Suzuki, seems to match up quite nicely, so let’s check ’em out. Honestly, looks alone were enough to make me cleave to the V-Strom in my research. Both rides follow a similarly sporty style with a vestigial front fairing and windshield, but with a more upright rider position than you would expect from a pure sport. Even the combination of angles and curves are similar enough, though the V-Strom isn’t quite as pointy in as many places as the FJ. As usual, this category is a matter of taste, and neither stands out as particularly beautiful or ugly to mine eyes, just functional. Both bikes run dial-in suspension components, though Suzuki limits the front forks to a simple spring-preload adjustment, so the FJ front forks pull ahead a bit with its additional damping adjustment. The rear shocks balance out with preload and rebound damping adjustments on both. Since they also share ABS as a stock feature, the brakes are a wash.
Yamaha runs an 847 cc, in-line triple for its plant, but the Suzuki designers opted for a 645 cc V-twin, a difference you can feel in the seat and hear in the exhaust note. 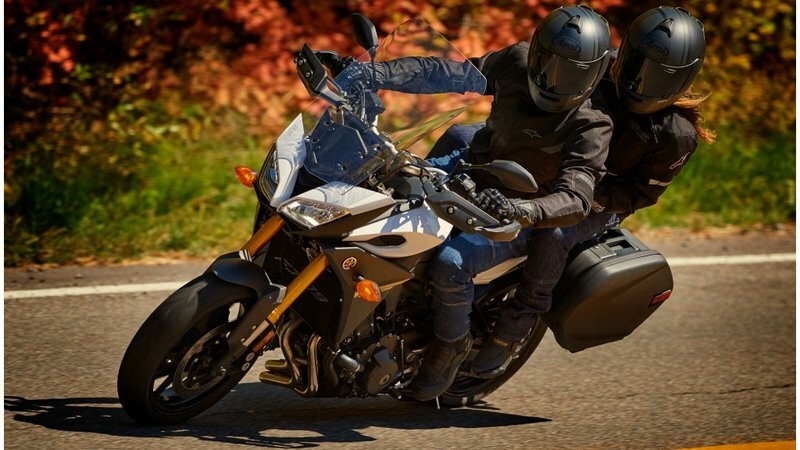 Both engines run on electronic controls, and while the V-Strom sports a dual-throttle valve setup that allows the engine to smooth out its own power delivery, that’s not quite the same as the traction control offered on the FJ, and can’t hold a candle to the Yamaha D-Mode function. I’d say price may be the biggest difference between these rides. 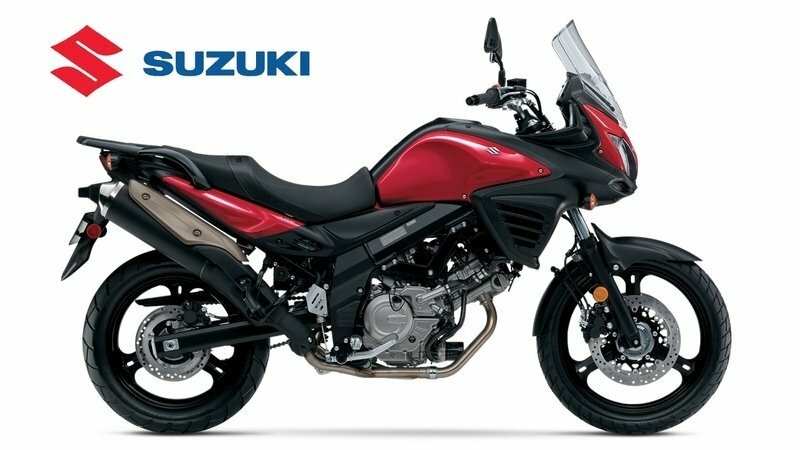 Suzuki comes out looking like a winner with its $8,549 sticker, but if you consider the technological edge of the engine offered on the FJ-09, the $10,699 price tag doesn’t seem to be as big a difference as it does at first glance. 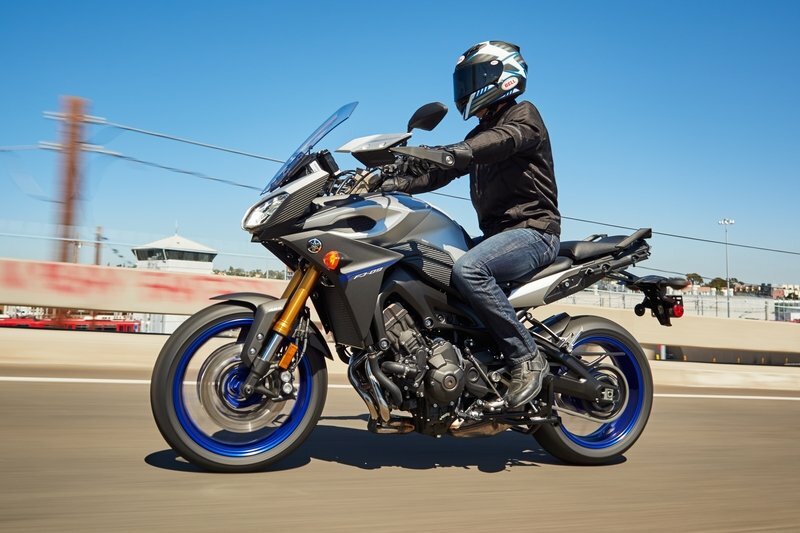 Bottom line: Yamaha is offering a lot of bike for the buck with the FJ-09. 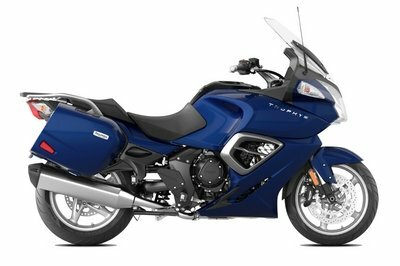 My wife and fellow motorcycle writer, Allyn Hinton, says, "I don’t know about you, but I am glad to see more bikes in this 600-1,000 cc range — plenty of oomph to give you a good ride, but not too intimidating for entry-level folks. I agree with my husband though, that something called a tourer should come standard with bags."